suitable for a variety of cooling/heating food processing, a variety of meat, liquid temperature measurement. It's can be used in outdoor barbecue, baby milk water, cold drink, jam, candy, baking, kitchen cooking etc. Pease read the user manual carefully to ensure the best operation of this digital meat thermometer. Thank you for purchasing from us - JayMag Team. 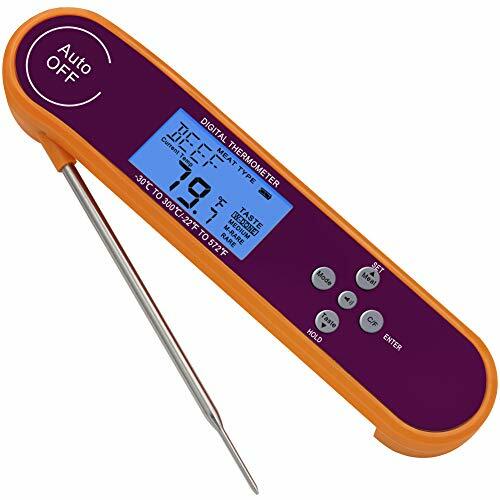 【Pre-set Instant Read Meat Thermometer】Ideal Temperature Pre-set for 8 types foods (BEEF LAMB VEAL HMBGR PORK TURKEY CHICK FISH) and 4 cooking taste selection, no longer worry about overcooking or under-cooking, enjoy food the way cooking professionally with this digital cooking thermometer. 【User-Defined Alarm Thermometer】You could set different temperature as alarm reminder according to your request, the thermometer will beep when up-to pre-set temperature, a good helper for cooking steak or preparing baby milk or even bathing water..
【Voice Broadcast Current Temperature】The thermometer voice function helps to hear the temperature form voice broadcast in where there is too much smoke, especially more convenient and friendly for the elderly with presbyopia. 【3 Colors (RGB) LCD Backlit】BLUE backlights on when thermometer power on or at measuring, GREEN lights up mean for proximity alarm temperature, the digital thermometer will beep and flash RED backlight when reach alarm temperature. Lights of different colors remind current temperature, advance warning, more intuitive and timelier. 【IP66 Waterproof & Durable】With an FDA food grade stainless thermometer probe, measures temperature in 3~4 seconds sensitively, and with an accuracy of ±1°C(1.8°F) degree with a wide range of -30°C~ 300°C (-22°F ~572°F). JayMag digital meat thermometer's body is made of strong ABS with IP66 waterproof and dustproof which can be washed easily without fear that water gets inside. If you have any questions about this product by JayMag, contact us by completing and submitting the form below. If you are looking for a specif part number, please include it with your message.